Adrian E. Miller – Soul Food Scholar » Does a Clambake Count as Barbecue? Does a Clambake Count as Barbecue? Trying to define barbecue often sets off a fireworks display that rivals anything you saw on the 4th of July. In the spirit of stoking that fire, I ask, should the New England clambake fit under barbecue’s big tent? Though barbecue is now the consensus meal for Independence Day celebrations in much of the country, it’s not our nation’s only outdoor-cooking tradition. In the nineteenth century, the clambake was just as popular in New England as the pit barbecue was in the South. They share some common elements: digging a pit in the ground, burning hardwood down to coals and embers, using a variety of meats (some clambakes also feature lobster, chicken, and sausage) and wrapping the food—seaweed and canvas for clams; aluminum foil and burlap for pork or beef—to create steam and/or minimize burning. The successful “bakemaster” and “pitmaster” are both revered in their communities. 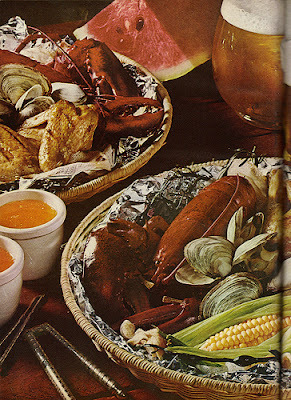 Traditional clambake fare gets gussied up for a 1968 Better Homes and Gardens cookbook. Of the many differences between clambakes and barbecues, an intriguing one is how each tradition accounts for its heritage. While acknowledging the Native American contributions in southern-style pit barbecue has waned over time, some scholars have argued that such influences are actually exaggerated within the clambake. In any case, if they’re cooking over a wood-fueled fire, I’ll invite New Englanders to bring their clams to the barbecue table.